I should be out the door right now. My assistant, Nancy, is getting married today! I will post pics of that later. It’s an all day event, so I don’t know if I’ll get the chance to post tonight. But I wanted to share some pics. Isn’t it the cutest?? I just love them. AND, they match my room colors. I got my kit from Paper Pesto. I am the guest designer for July. I already started on some great projects, so check out their website in the middle of the month to see my designs! I am so excited, and Kate and Fiona are just wonderful! Look at all this fun stuff! And the colors are just gorgeous! 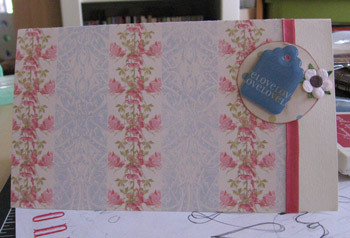 I made this card really fast for the Nancy’s wedding gift. And now I’m going to be late! I’ll try to post tonight, if I’m not too busy cleaning! 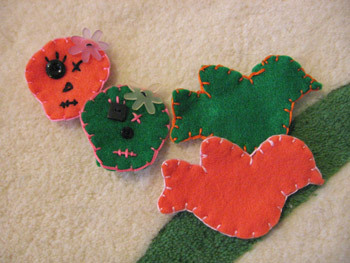 those skulls are the cutest.. i still have mine i have to use! 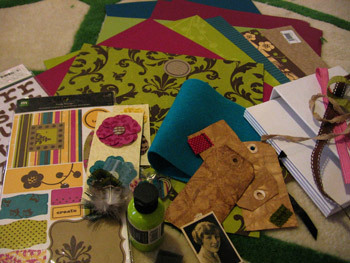 that kit is too cute, i love the colors, can’t wait to see your creations.. love the cards sista! Oh, you’re a scrapbooker (is that a word?)! My sister does scrapbooking and I have a huge amount of respect for it – she helped me do my wedding scrapbook and while I had fun, I just don’t have the patience to pull it off! I see you also read Crazy Aunt Purl, too; I’m a knitter and I love reading her blog! Hi, Michele sent me (today! ).